I had to be in New Hampshire as I headed north out of Boston. I didn’t need to be in Concord until the next morning, so I meandered up slowly along the coast. Originally I was going to stop in Portsmouth for the night — it being the twin city of Estonia’s Pärnu — but when I was doing my research I found this place that I’ve never heard of before called Stages at One Washington in Dover. So I decided to stop at this town just north-west of Portsmouth. I switched my booking to a little earlier in the evening since I was in town already and wanted a good night sleep for an early morning, so I walked down there. One Washington is the location of a historic mill in Dover, now converted into lofts for shops and food and drinks. I eventually found Stages and it looked…abandoned. I walked in, no one is anywhere. Then suddenly Chef Evan Hennessey shows up and seats me at the counter. He explained to me that they got a last-minute catering gig and all the staff were there, so it was just gonna be him running the restaurant solo. Wow, really? He said there are 2 other couples with bookings, so it’ll be 5 diners and chef — who was pouring water and bringing silverware while explaining the menu options. There were several, a very, very interesting a la carte, but for some reason I went with the 10-course tasting. There was just something about this menu that looked so interesting. And the wine pairing. Chef acted as sommelier too, pouring the wine. Then one of the couples showed up as he was just starting up cooking my first dish, and they decided to order the same 10-course menu — much to chef’s relief I can imagine! I told him feel free to synch us 3 to make it easier on himself. But he was a pro and worked hard, synching us only at dish 2 and letting me enjoy the first dish first. He returned to cooking and it looked even more interesting. 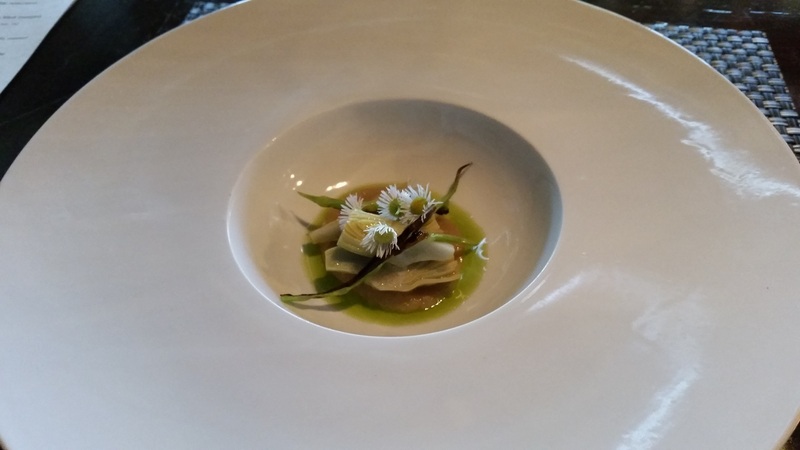 The second dish soon appeared once he finished putting the aster flowers on top. Looked brilliant, the artichoke was extremely tasty. I’m not a fan of sunchoke in general (well, mostly for its issues with our digestive system), but worked well in puree. A bit of radish too added to texture and complexity. Another excellent dish that shows off the best of nature. 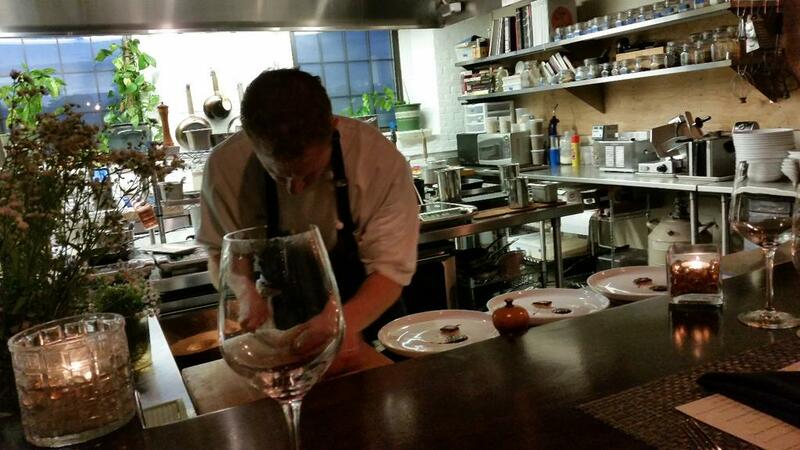 Chef clears out plates and once again replaces silverware and pours wine and water while he’s cooking our third dish. Hardest working chef in the country I suspect, on this odd night. He’s slicing and cooking and suddenly our third dish was put together. It’s a tasting of some excellent potatoes, accompanied by goose yolk. 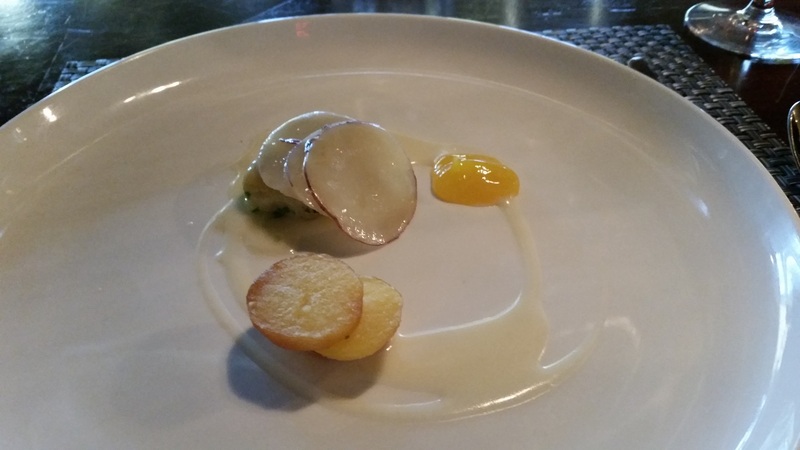 What a rich way to treat the humble potato, in several different methods as you can see, all with that decadent goose yolk. Mmmm, this was just delicious! Now we have a fresh raw oyster bathing in a crab consomme, with some more fresh local radish and other delicious items from the earth. 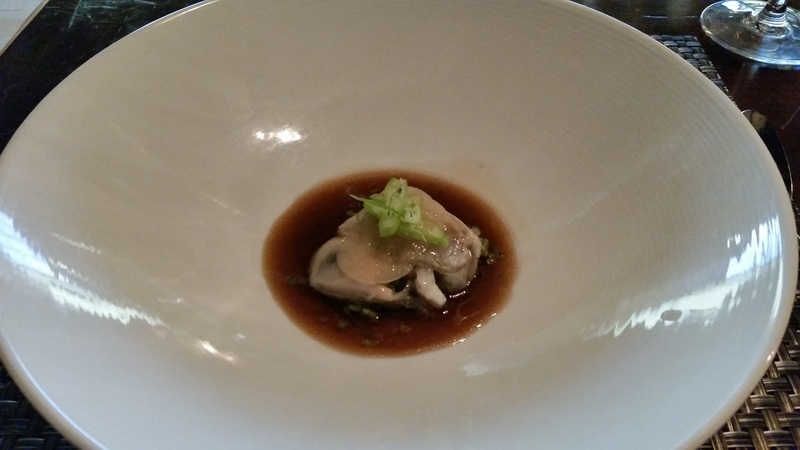 The rich broth brought out a nice touch to the oyster and the radish, which added texture. A fine dish, very happy so far! Still, chef is still pulling one-man duty cooking our food, bussing our dishes, pouring our new wines from the pairing menu, topping off water, and chatting with us. This man is a wonder, and you can see he’s actually enjoying himself despite doing the job of a whole team. He’s got a lot going for the next dish and we sense the meal is moving to a new stage with dish #5, and I was indeed right. 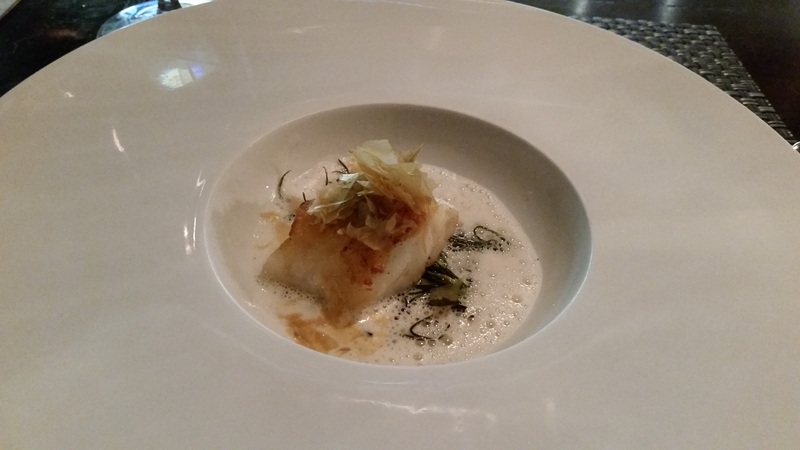 This dish focuses on cod, bathing in a very well-done oyster sauce. Some strings of dried agretti grace the sauce, but the most interesting side item is the “oyster chip” — which is extremely concentrated and deep tasting, something I can see becoming a huge snack trend in Asia! Cod was fantastic, especially with the rich sauce. Chef did well turning one of the fishes I consider most boring into something very delicious. At this point one of the staff returned, and you can see chef’s face relax. She took over the FoH duties, and chef could concentrate fully on the food, and the next dish was the most complex one so far. This dish focused on lamb neck, which was ultra tender from braising, accompanied by flageolet beans and a bit of black trumpet mushrooms (which I love). The richest dish of the night, solidly fabulous! Chef was still on top of his game despite not having to worry about wines and clearing our dishes, and he worked hard to get the next dish together quickly. He did mention there were 2 more diners coming tonight, so he can’t quite relax even as we reach dish #7. I was really looking forward to this, the corned beef heart. Excellent preparation, without removing the unique taste of the heart. The small charred kohlrabi was surprisingly delicious too. This chef is a master with simple but tasty vegetable preparations! 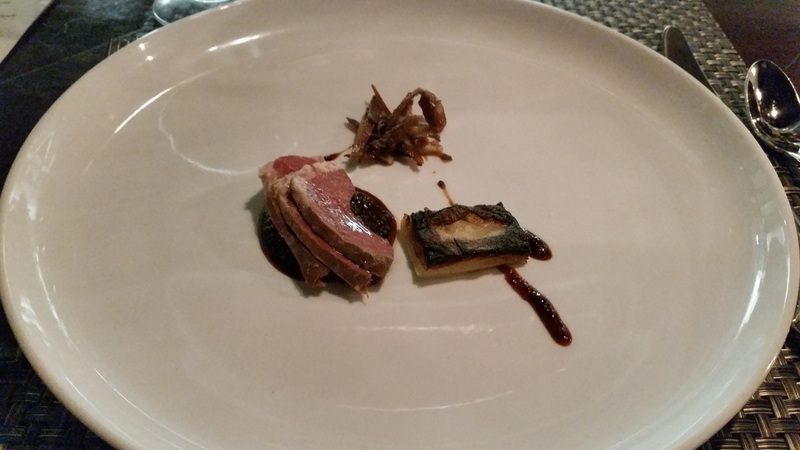 Excellent, chef has pulled off this meal with skills that few chefs have — not just running the whole restaurant single-handedly for the first half of the meal! Wow, this was kinda wild. With cauliflower essence. Cauliflower worked so, so well here. Wild but rich and fabulous, this is one of the most interesting cheese courses I’ve had in ages. Lovely! Now the 2 other diners arrived and chef went through the menu options, and they apparently went with the “other” menu — the so-called “Secret 8” menu. This is a menu made from the a la carte menu selections, but just everything — all 8 dishes offered. None of them were the same as the tasting menu’s 10. So chef, by himself, had to execute 18 dishes in this service running solo. Wow. One of the pleasures now as he simultaneously work on our #9 and their #1 is seeing how he balances things and makes sure all runs smoothly. He gets their first dish out first (which happened to be veal terrine) as he then put our first dessert course together. Mmm, one of my favourite things, beets. Lovely stuff, with strong flavours. 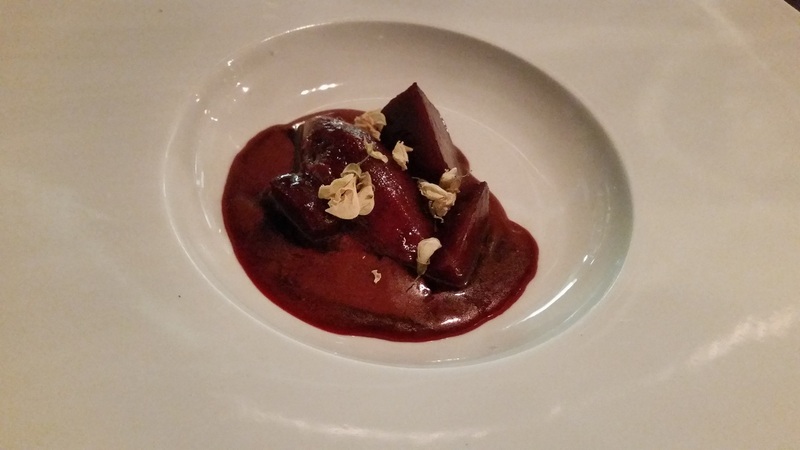 I love beets, and the sorbet was lovely as well. All of us were pretty full so we were enjoying this course slowly — but partly me and the couple next to me wanted to see the other courses too! 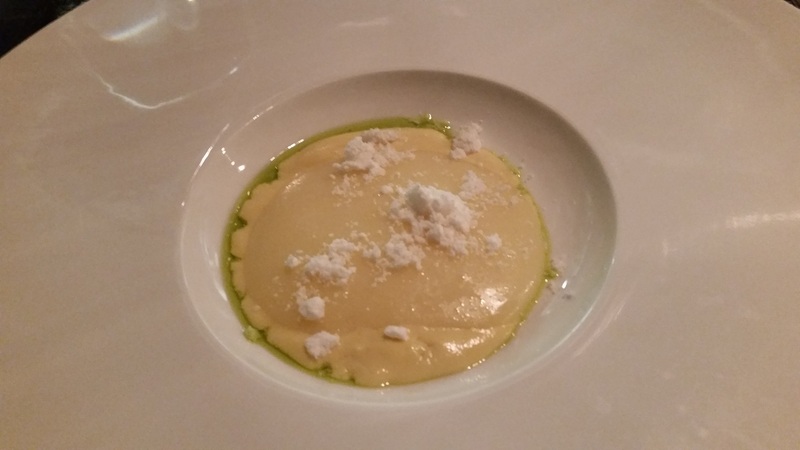 And in the mean time we saw chef bring out a duck egg and spigiarello (!!!) dish, then after that a small “carbonara” with duck prosciutto. Wow… Remember, it’s only him in the kitchen. He didn’t forget about our final course, the last dessert, and that soon appeared. I ordered a calvados and just chilled watching the other dishes come for the other diners, drinking really slowly. 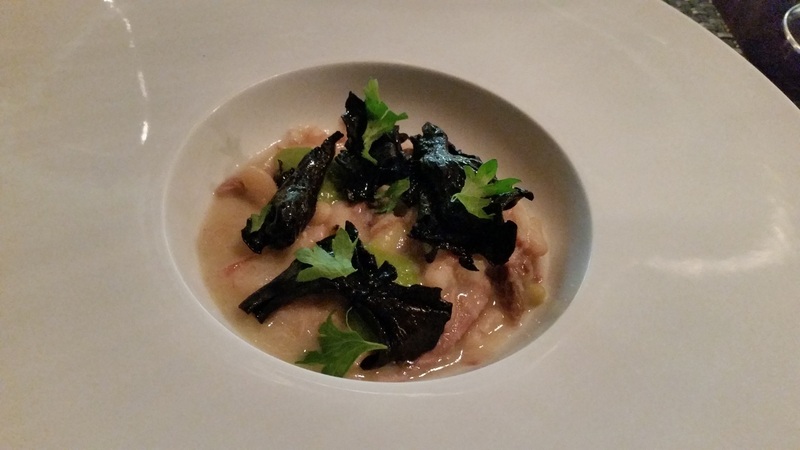 First was a cusk dish in a green crab dashi, then finally a boar and kohlrabi dish. Oh my goodness, I really need to come back to do the other menu!!! The last of the others’ food are cheese & dessert so I think I’ve been overwhelmed enough. Did I mention chef was doing everything solo? Wow. I thanked Chef Hennessey profusely and headed out and wandered back to my hotel. 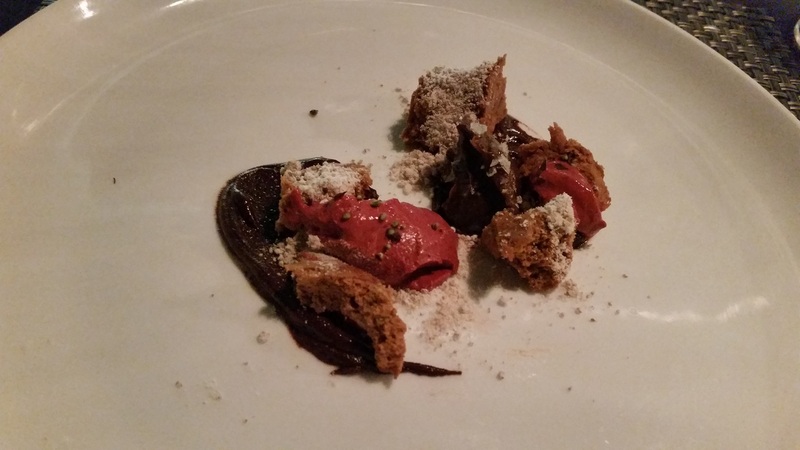 This was one of the best, most interesting tasting menus I’ve had in a long time. It’s unique in approach, focusing on fresh local produce far more than other tasting menus, even more than places like Maaemo. 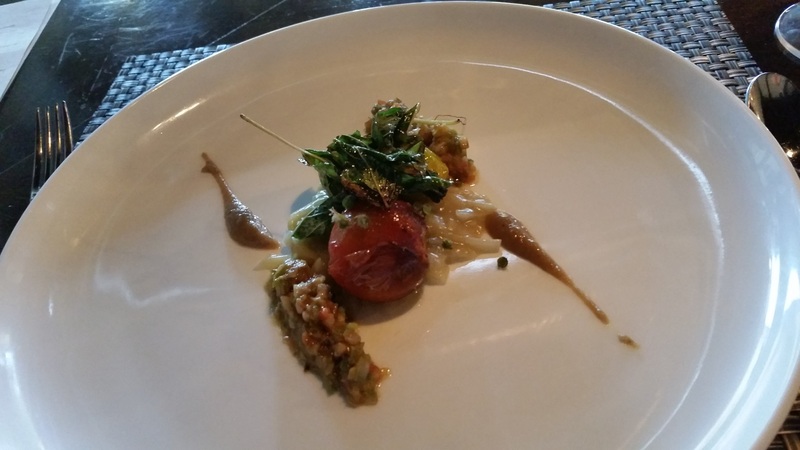 There is a deep love and understanding for the stuff that grows locally by Chef Hennessey, and now I see why he’s rated so highly even though he’s in a hidden-away place like Dover. This guy is damn talented. And frankly, it’s like having a private chef for a night. Oh, what a night… Beyond recommended, worth a massive detour just for dinner here!